When I see the UPS truck drive right up to our front door, I know we're about to get something special. Today was no exception. 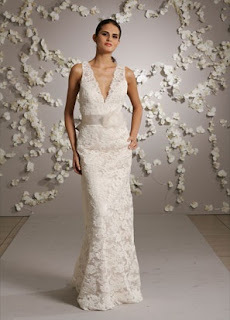 I could see the JIM HJELM box from a mile away and when I unwrapped what was inside I got super excited. There, folded nicely in white tissue paper was our first JIM HJELM bridal gown! 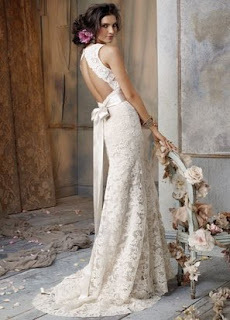 It's an Ivory French lace fitted gown with a sweep train. The V is plunging and the back is open. It has a beautiful faux flower attached to a silky ribbon. We have nothing like it at the moment....and it's beautiful!